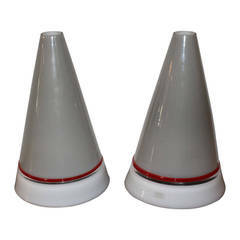 Italian 1970s Contempo pair of table lamps. Fume dome and chrome base. 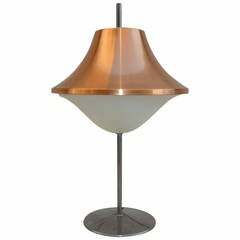 Copper and perforated plexiglass shade, nickel base. Giuliana Gramigna for Artemide design pair of lamps. Opaline glass and brass Italian table lamps. Polished brass cubic base over a wood core, the brass decorated with a diagonal design. Height (with shade): 34". 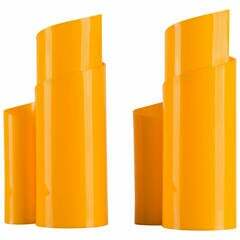 Set of two Italian 1970s table lamps featuring lacquered base and curved plexiglass diffusers. Rare set of two Italian 1970s table lamps. Strongly influenced by the "Chimera" lamps by Vico Magistretti, the set keeps its originality due to unusual shape and color. 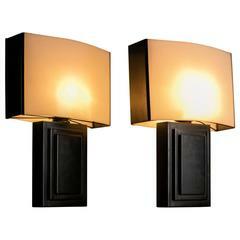 A pair of brown Lucite table lamps Labelled "HARVEILUCE" with a demilune shade. With original continental wiring, Italian, 1970s. Table lamp Italy, 1970s. Nickel-plated and Lucite Original condition.